Me Pierre Deschamps graduated from the Faculty of Theology at Université de Montréal in 1972. He graduated from the Faculty of Law at McGill University in 1975. He has been a member of the Québec Bar since 1976. Me Deschamps was an adjunct professor at the Faculty of Law at McGill University for 20 years where he taught in the areas of tort law and human rights. He was also research director at the Quebec Centre for Private and Comparative Law for more than 20 years. Me Deschamps is well known for his expertise in human rights, health law, medical law, ethics, research ethics and organizational ethics. In 1994, he presided over a committee of experts in Québec set up by the Health Minister to study control mechanisms in relation to clinical research. The resulting Deschamps Report served as the basis for the elaboration of the Quebec Ministry of Health Services and Social Services’ Action Plan in Research Ethics and Scientific Integrity. Me Deschamps was a member of the research ethics board of the Faculty of Medicine at McGill University and at the Montreal Heart Institute for over 15 years. He was also a member of the Board of Directors of the National Council on Ethics in Human Research (NCEHR) of Canada for eight years and chaired its Evaluation Committee for 6 years. Me Deschamps was a member of the Panel of Experts set up by the three Canadian Federal Granting Agencies to revise the Tri-Council Policy Statement (TCPS 2001 – 2008). He also served as an expert on the Experts Committee on Accreditation set up by the three Federal Granting Agencies to assess the need in Canada for an accreditation system for organizations conducting research on humans (2006 – 2007). He is the author of several publications pertaining to research ethics. Me Deschamps has acted as a consultant for a number of universities, healthcare institutions and clinical research organizations in the area of research ethics. For ten years (2000 – 2010), he was a member of the Canadian Human Rights Tribunal. 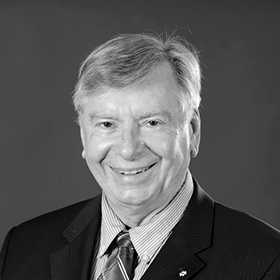 In 2000, Me Deschamps was made a Member of the Order of Canada for his contribution to research ethics as well as for his involvement in the cause of children suffering from cancer.